Shows you how real faith looks in real life as you walk through this thrillingly challenging New Testament letter. What is the difference between genuine faith and counterfeit faith? How do we know for sure that our faith is real? How can we know joy even in trials, and patience even in suffering? You can read through this book as a normal book… work through it as part of your daily Bible-reading routine… or use it to help you teach this letter, whether in small groups or from the pulpit. In these pages Sam explains how this explosive letter can shape the way we relate to God, to the church, and to the world. If you are looking for an insightful, convicting, encouraging, accessible guide to the book of James, then this is the guide for you! Sam Allberry shows with his characteristic candor and empathy how God's wisdom lands in our living rooms, board rooms, and churches. 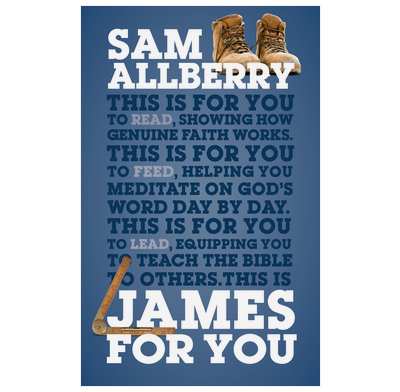 The ways in which Allberry highlights the clarity, unity, and simplicity of the book of James are truly enjoyable. His illustrations will stay with me for a long time. I used this as a companion when reading James and preparing notes for children's work to go alongside the sermon series we were doing. I found it easy to use and simply put, meaning that I could adapt what I was reading and learning myself for the children. I would recommend this as a book to read alongside James and have extended times of study. It has depth without being overly academic and impenetrable.